2014 Briggs & Stratton 5000 Watt 030467-0 for sale in Athens, AL. Haney Equipment Company Inc.
Hardworking, reliable home back-up power generator! 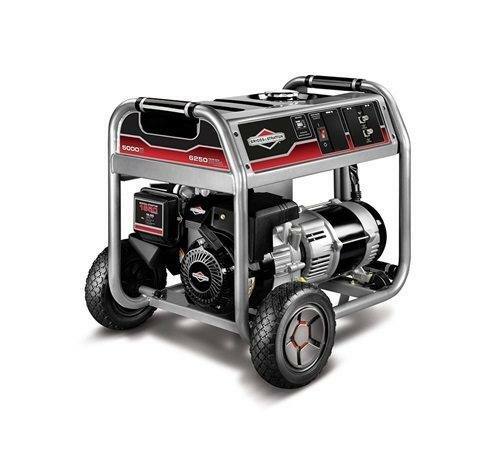 Powered by a Briggs & Stratton 1650 Series™ OHV engine for long life, high performance, and great fuel efficiency. The Power Surge™ alternator produces up to 25% more surge wattage to start large motor-driven appliances and tools simultaneously. 10" Never Go Flat Wheels: For easy mobililty. 5 Gallon Metal Fuel Tank: Provides up to 10 hour run time @ 50% load. Power Surge™ Alternator: Produces up to 25% more surge wattage to start large motor-driven appliances and tools simultaneously.